Katydids are similar to large grasshoppers, but they usually don't jump like their cousins. They are slow and awkward on the ground, preferring to climb trees and large plants for safety. Their short life spans -- often about a year -- help keep the populations under control. Only one generation is produced each year in most cases. Katydids start as eggs laid near the end of summer in the dirt beneath a plant or in holes an adult female has dug into plant stems. The mother most likely is going to die in the first frost of fall, but her eggs will survive winter in their protected location. The eggs will dormant until warmer weather starts to break in the spring. When spring rolls around and the eggs hatch, small nymphs emerge. 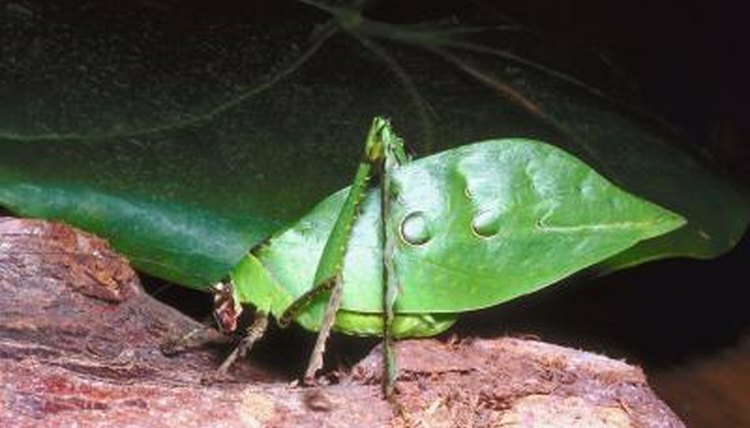 Katydids spend three to four months as nymphs. They look much like adult katydids but don't have wings. The nymphs molt as they grow, which means they shed their hard, outer shells multiple times before becoming adults, complete with wings. The fully shaped empty shells left attached to the sides of trees and other surfaces are your tangible evidence of molting. When katydids becomes full-grown, typically in July or August, they're nearing the end of their lives. After their final molt, they're ready to mate. Males provide sperm to the females, who lay about 20 eggs in their chosen protected spots. Most female katydids lay eggs only one time near the end of summer. After moving on from laying their eggs, they might survive two or three months until the cold frosts of autumn kill them. In the warmest states and tropical regions where it's never cold enough to frost, katydids can live longer, up to several years. Katydids serve as food for birds or small mammals, so they don't all live to see a single retirement check. Meanwhile, these swarming insects eat leaves, and large infestations can decimate produce fields -- so some farmers use chemical control to rid their areas of katydids. Many chemicals that are most effective against katydids are relatively slow-acting, and they don't harm the insects' eggs, so they don't endanger future generations of katydids.